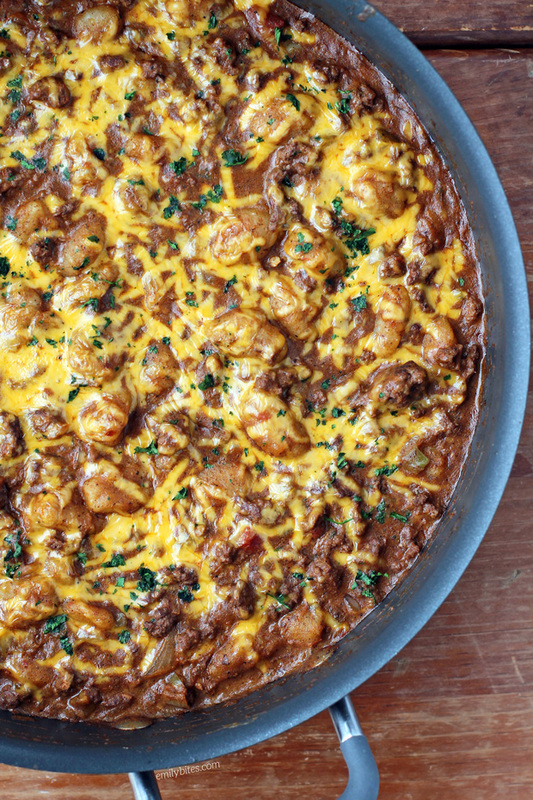 This Spicy Taco Gnocchi Skillet may not be the most beautiful dish I’ve ever made (one-color dishes can be tough to photograph), but trust me, you need to try it. 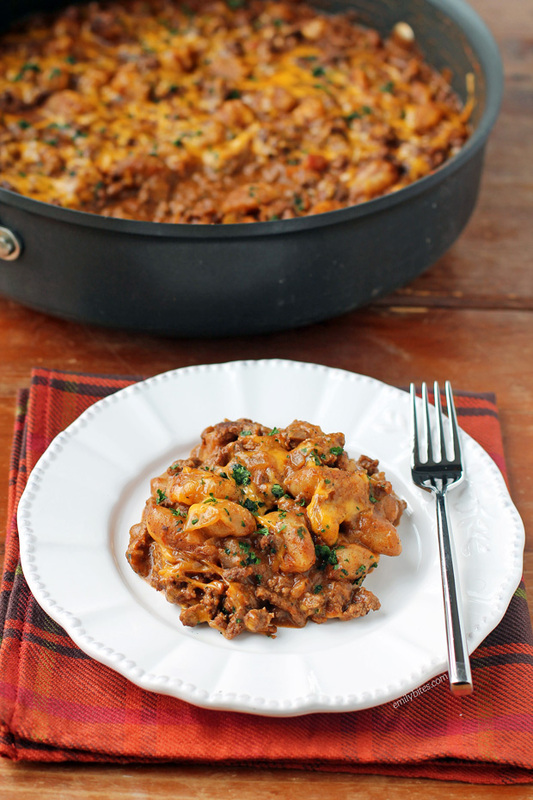 The soft potato gnocchi perfectly balances out the spicy kick from the homemade taco seasoning and the cheddar and sour cream give the sauce a rich, creamy texture. The corn kernels add sweetness which stands out in this spicy dish, and the whole thing comes together really easily for a one-pot meal everyone will love. Perfect for weeknights! Each serving is only 334 calories or 8 Weight Watchers points, but you’ll never guess it’s lightened up once you taste it. So, if you read that first paragraph or looked through the ingredients, you may be looking at these photos and thinking “where’s the corn? ?” Sigh. When I made the recipe this time around to photograph I forgot to add the corn! /facepalm. I took the corn out of the freezer and when I took out my laptop out to read through all my recipe notes while cooking, the corn ended up behind it. It just completely skipped my mind and I didn’t even notice until I sat down to edit the photos. So…sorry that the photos don’t contain all the ingredients! I will try to make it again soon and take new pics, but I’m posting it now anyway because I wanted to get the recipe out here to you all. It’s so, so good. Looking for more lightened up pasta dishes? Try my Sausage Tortellini Skillet, Cheesy Chicken Veggie Pasta Skillet, Chicken Cordon Blue Pasta Bake, Pumpkin Alfredo Tortellini Skillet, Tomato Soup Mac & Cheese, Creamy Pasta with Sausage and Mustard Seeds, Spicy Sausage Pasta, Spaghetti Pie, Pumpkin Mac & Cheese, Spicy Sausage and Eggplant Pasta Bake, Cheesy Taco Pasta and more in the pasta section of my recipe index! In a small dish, stir together the chili powder, cumin, salt, pepper, paprika, onion powder, garlic powder, oregano and red pepper flakes until well combined to form a taco seasoning. Set aside. In a large skillet, melt the butter over medium-high heat. Add the gnocchi to the pan and stir to coat with the butter. Spread the gnocchi into a single layer and cook for 2 minutes until the bottoms begin to turn golden. Stir the gnocchi and cook on the other side for 2 more minutes. Remove the gnocchi to a side plate and reserve for later use. Reduce the burner heat to medium and place the ground beef in the hot skillet. Cook the beef, breaking it up with a wooden spoon until it starts to brown. Add the onion, garlic and the taco seasoning from step 1. Stir together until well combined and continue to cook until the beef is browned and the onions are softened. Drain if necessary. Add the salsa, beef broth, corn kernels and the reserved gnocchi to the beef mixture in the skillet. Stir together and turn the heat up until the mixture comes to a boil. Cover the pan with a lid and reduce the heat to medium-low to simmer for 5-8 minutes until the gnocchi is softened and the liquid is somewhat reduced/absorbed. Remove the skillet from heat and stir in the sour cream and about half of the shredded cheddar. Sprinkle the remaining cheddar over the top and cover with the lid for 1-2 minutes until the cheese melts. Sprinkle with cilantro if desired and serve. I’m allergic to cilantro and dislike onions, so salsa is a tough one for me. Any suggestions on a salsa substitution? Seriously made me feel better about myself to hear that an expert cook like you can make mistakes like I am known to do! 🙂 Cannot wait to try this one! Looks and sounds incredible! Oh jeez, I mess stuff up all the time, haha. This one just happened to be obvious in the pics and I decided to post it anyway ;). I hope you love it! I’ve been making your recipes for several years now and it has really helped me lose weight and keep it off. I recommend your site to everyone I know. Thanks so much for providing great tasting recipes. I have a question regarding this recipe – Is the Gnocchi dry in a box or the refrigerated kind? Thanks. Hi Kim, I’m so glad you’re loving the recipes! Thanks for spreading the word :). This is the exact gnocchi I used: http://www.wegmans.com/webapp/wcs/stores/servlet/ProductDisplay?productId=728002&storeId=10052&langId=-1. It is not refrigerated, it comes on a package and I found it by the boxed pasta. Hi Emily! I just adore your recipes…they are simple to make but full of flavor. I even like reduced fat cheese when it is in your recipes, which is a miracle 😉 But don’t ask me to go fat-free with the cheese, LOL! Anyway, when you say “chili powder” do you mean a chili powder that is a combo of other spices, or a straight Cayenne pepper chili powder? Hi Sara, thanks so much for the kind words! I agree with you on the fat free cheese – yuck! Haha. I just mean normal chili powder (just labeled chili powder), the kind you use to make chili. Here’s an example: http://www.mccormick.com/Spices-and-Flavors/Herbs-and-Spices/Spices/Chili-Powder. Does that help? Emily, this looks wonderful. I think I’ll try it this week! Thank you so much. I made this today and it was delicious and very filling! My family loved it. It will definitely be a dish I make again and again. Emily, I made this for dinner tonight, and it was a huge hit! I will say that instead of your spice blend, I used 7 tsps of a taco seasoning mix I’d already made (salt-free) and had in my pantry. Otherwise I followed your recipe, and it was so easy and delicious. I never would have thought to use gnocchi in a Mexican-style dish. This is definitely going into the dinner rotation! I am wondering if this could be counted as a simply filling recipe if using whole wheat gnochi. Any thoughts on that? Great flavor in this recipe and easy to make!! Thanks for putting it out there. This recipe was delicious, I’m glad I finally made it. For those wondering if you can substitute a taco seasoning mix – I did and it tasted great! I’m confident Emily’s original spices would have been awesome, but in a time crunch the pre-made seasoning is perfect also. Also, I used sweet potato gnocchi – that was what my store had – and it gave the meal a really nice, complimentary sweetness to it! Stop what you’re doing RIGHT NOW. Go to the store & buy these ingredients & cook this! It was super good & easy to make! My husband absolutely loved it. They didn’t have WW gnocchi at my grocery store. I made I with regular potato gnocchi so I don’t know the points, but will be making again as soon as I find the right gnocchi. (And I left out the corn on purpose.) Thanks again Emily! I have purchased frozen gnocchi for this recipe. Do I need to boil it prior to using it? Or will it cook entirely in the pan? I have never used frozen gnocchi before so I’m honestly not sure. I’m guessing you can use it in the recipe but it might just take longer to cook? Let me know how it turns out! This was so amazing!!!! It reminded me of chili. Super filling too. I did have a hard time finding the whole wheat gnocchi. I ended up ordering a pack of 6 on Amazon. Which is fine by me because I’ll be making this again and again. Thank you! I’ve only ever made this as a skillet meal. Not sure how gnocchi does in the crock pot! i cannot, for the life of me, find wheat gnocchi anywhere during my weekly commute. i’ve tried four stores with no luck. 🙁 how would the potato gnocchi change the WW points value of the dish? and would wheat pasta be a viable substitute? just troubleshooting here… i could also order the pasta on amazon i suppose. keep up the great work! thanks for the great recipes. It looks to me like using regular gnocchi will add a point per serving, but you may want to check by using the recipe builder with whatever brand you use. Hope that helps! This sounded so wrong it might actually be right, and it is! I’m a good Italian girl, known for making her own ricotta gnocchi from scratch but I also love Mexican food so this recipe spoke to me from the beginning, bizarre as I thought the combination was. I made it last night and it is amazing. The corn is needed to add a little sweetness because this is spicy (my nose started running from the spice) and the gnocchi gives the needed starch to cool it off as well but all in all, this is the coolest, most uniquely delicious Mexican dish I’ve ever made! I just found your blog a few days ago after a friend of mine linked you in one of the meals she made and posted on instagram. I scrolled through your recipes and can’t wait to try them all!! This is the second recipe I’ve tried of yours and I’m finding that you really don’t disappoint! My boyfriend and I loved this meal and the gnocchi is a really great addition. I never thought of using it in a taco setting but it was delicioussss. Thank you so much for all your recipes and posts, you’re making my dinners easy, tasty, and healthy! Do you think this could be made with ground turkey and chicken broth instead? I dont eat red meat, but this looks yummy! thanks! Tried this tonight and it was delicious! My family loved it and they never like anything that I cook….ever! Thanks Emily! I made this tonight and my very picky husband LOVED it! Will be making again – it was so good! Made it for a second time today. We really like it. I did not put corn our sour cream in it and it was still good. My kids added sour cream to their own serving. Love making something and not having to figure out the points. Thank you!!! Did it still taste great without the corn? Have you made it with ground turkey? Do you boil the gnocchi first or does it cook in enough liquid to make them pillowy? We only get the dry kind like you described in the box in the pasta aisle. It will cook in the liquid! Oh my, this was ridiculously good! I made it exactly as you suggested since the points are already figured out. My only disappoint is that I could only have 1 cup . Thank goodness for leftovers, can’t wait for lunch tomorrow! This would be a good dip! I’ve tried about a dozen of your recipes so far and I’ve loved all of them but THIS ONE is just incredible. Super easy, not too spicy for my kiddos, and unbelievably delicious. You’d never know it was low points. This is one of my fave recipes but since the switch to Freestyle I don’t often have the pts – but, tonight I made it with shredded chicken and it was great that way too! After an emotionally taxing day attending a funeral on a very rainy day, this was the perfect thing to come home to. It is comfort food all the way. Made as directed so it definitely had a kick. Regarding the sea salt, I used table salt and the end product seemed salty to me. I’m wondering if I should have cut it by half since the table salt is probably finer grained. Nonetheless delicious and next time I’ll just adjust the salt. Wonderful recipe. Thank you, Emily!!! I love gnocchi and anything Mexican flavored so a WINNER!!! I couldn’t find wheat gnocchi so I just used regular potato gnocchi. I plugged all the ingredients in the WW app and it actually came out to 7 points per serving with 96% fat free ground beef. Woohoo! It was DELICIOUS!! My boyfriend and I both loved it. Hard to believe it’s healthy. Great comfort, fall food.